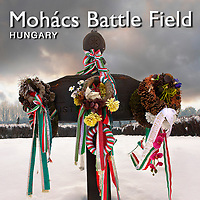 Mohács Battle Memorial pictures, photos. Images of the sculptures of the Mohacs memorial to buy on line as stock photos or photo art prints. The Battle of Mohács (Hungarian: mohácsi csata or mohácsi vész; Turkish: Mohaç Sava?? or Mohaç Meydan Sava?? ; Croatian: Bitka na Moha?kom polju) was fought on August 29, 1526 near Mohács, Hungary. In the battle, forces of the Kingdom of Hungary led by King Louis II of Hungary and Bohemia were defeated by forces of the Ottoman Empire led by Sultan Suleiman the Magnificent. The Ottoman victory led to the partition of Hungary for several centuries between the Ottoman Empire, the Habsburg Monarchy, and the Principality of Transylvania. The death of Louis II as he fled the battle marked the end of the Jagiellon dynasty in Hungary and Bohemia, whose dynastic claims were absorbed by the Habsburgs via the marriage of Louis' sister.